Click "Update" below. You'll see a text field appear below. Manually add any settings if you need. Click "Download" below. Your browser will prompt to open/save autoexec.cfg. Do not change these unless you know what you are doing. Remember, these settings are client-side so if the server is 64tick it will set you to 64tick. Because some servers are 128 tick, it makes sense to have the best possible settings, so that you can take full advantage of these kind of servers. Headphone Pan Radial Weight ? Voice Chat In Lobby ? Draw Tracers In First Person Mode ? 0 = No filtering of the console. 1 = Removes EVERYTHING apart from what is caught by the filter. 2 = Highlights the stuff caught by the filter and keeps everything else as is. Automatically switch to better weapon if picked up ? Remove Most Of The Hud in DEMO-mode? Show Your Speed And Detailed Position ? If you decide to go with Preset Position 0 (custom), use the sliders below. The commands below has little to no effect on your game. They primarily relate to how much of your screen is covered with your own weapon/arm. Keep them all at the lowest settings possible, as there is no good reason to display more of your gun. By default they should all be set to their lowest. Your autoexec is a good place to include keybindings if you have a handful of go-to keybindings you always use. Right now you currently have the possibility to bind the entire numpad, function keys from F1 to F8, the four arrow keys, and up to 6 custom keys. If you dont wish to bind something, or have already bound it in your game, leave the fields relating to it blank. This will not touch your existing keybinding. On the bottom of the page you will find some suggested bindings, along with a list of weapon names, should you find yourself interested in keybiding weapons purchases, which is a very common thing to do. We've made room for 6 custom keybindings. Leave fields blank if you dont wish to keybind a button, or already have a binding you dont want to brake. If you find yourself 1v1, and your teammates are distracting you in the voice chat, binding "toggle voice_enable 0 1" to one of the custom keys (for instance V) might be a lifesaver. You might find that you ALWAYS pick up a small set of items, regardless of how your rounds are going. Keybinding these might simplify some of your gameplay. Consider for instance binding one of the function keys, like, say, F1, to buying these items. 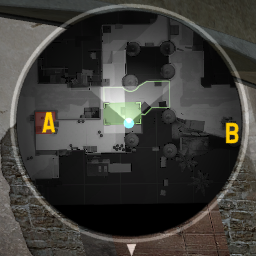 The command "buy defuser; buy vesthelm; buy vest; buy flashbang" will buy a defuser, a vest (with helmet if you can afford it) and a flashbang. An excellent package that can yield you a kill or two. I'm not going to reinvent the wheel, the people over at krisskarbo.com had already made a awesome crosshair generator, check it out over here, and copy the settings that you enjoy into the text box below after you have clicked "Update" and finished all your other settings.